HB 1594: Why buy the cow when you can get the milk for free? Previously: SB 718: Why buy the cow when you can get the milk for free? Uh, has anyone noticed a groundswell of people volunteering to work for free on public works projects? INTRODUCED BY REPRESENTATIVES DAVIS (Sponsor), LANT, REHDER, MOON, LICHTENEGGER, BERRY, LYNCH, LOVE AND KELLEY (127) (Co-sponsors). To repeal section 290.230, RSMo, and to enact in lieu thereof one new section relating to volunteer labor on public works projects. 290.230. 1. Not less than the prevailing hourly rate of wages for work of a similar character in the locality in which the work is performed, and not less than the prevailing hourly rate of wages for legal holiday and overtime work, shall be paid to all workmen employed by or on behalf of any public body engaged in the construction of public works, exclusive of maintenance work. Only such workmen as are directly employed by contractors or subcontractors in actual construction work on the site of the building or construction job shall be deemed to be employed upon public works. Any such workman who agrees in writing to volunteer his or her labor without pay shall not be deemed to be employed upon public works, and shall not be entitled to the prevailing hourly rate of wages. 2. When the hauling of materials or equipment includes some phase of construction other than the mere transportation to the site of the construction, workmen engaged in this dual capacity shall be deemed employed directly on public works. So, what happens when a “volunteer” who is “not deemed to be employed upon public works” is injured working on a public works site? Right. SB 718: Why buy the cow when you can get the milk for free? Read 1st time January 14, 2014, and ordered printed. 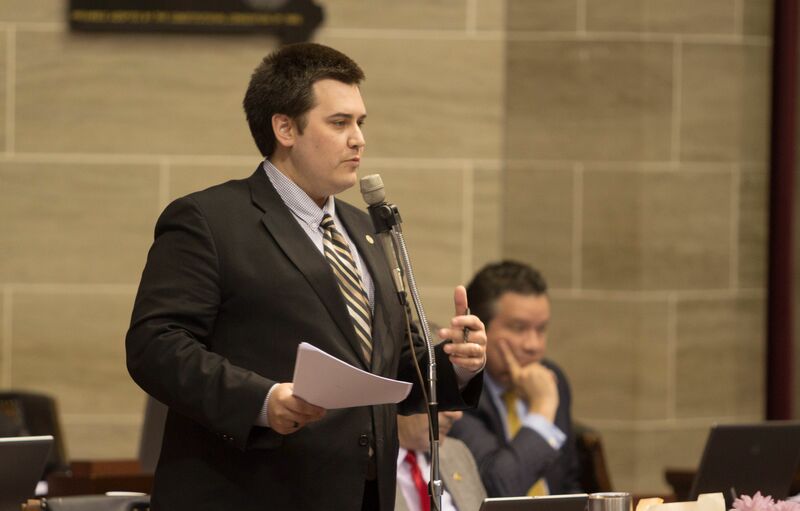 Missouri’s Prevailing Wage Law establishes a minimum wage rate that must be paid to workers on public works construction projects in Missouri, such as bridges, roads, and government buildings. The prevailing wage rate differs by county and for different types of work. The Prevailing Wage Law applies to all public works projects constructed by or on behalf of state and local public bodies. Establishes the School Construction Act which exempts construction and maintenance work done for certain school districts from the prevailing wage rate requirement upon the school board’s approval. SB 30 – This act repeals all of the prevailing wage laws. Because building public works on the cheap will absolutely insure higher quality workmanship, right? Or maybe a much higher profit margin for someone who isn’t a worker? Let’s work to make sure all workers in Missouri just get paid minimum wage. Then we can work to repeal the minimum wage. Utopia for right wingnuts! Our parents teach us many valuable lessons when we’re growing up. 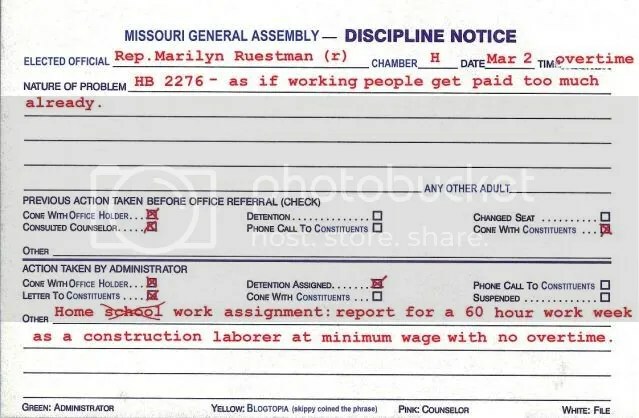 Among those offered by my father, and taken to heart, were “never vote for a republican” and “you get what you pay for.” HB 2276, offered by Representative Marilyn Ruestman (r), embodies both of those life lessons. Right, let’s further diminish the wages of hard working men and women in favor of a lower tax burden for the top 1%. If you’re a republican that makes perfect sense. …. (5) “Prevailing hourly rate of wages” means the wages paid generally, in the locality in which the public works is being performed, to workmen engaged in work of a similar character including the basic hourly rate of pay and the amount of the rate of contributions irrevocably made by a contractor or subcontractor to a trustee or to a third person pursuant to a fund, plan or program, and the amount of the rate of costs to the contractor or subcontractor which may be reasonably anticipated in providing benefits to workmen and mechanics pursuant to an enforceable commitment to carry out a financially responsible plan or program which was communicated in writing to the workmen affected, for medical or hospital care, pensions on retirement or death, compensation for injuries or illness resulting from occupational activity, or insurance to provide any of the foregoing, for unemployment benefits, life insurance, disability and sickness insurance, accident insurance, for vacation and holiday pay, for defraying costs of apprenticeship or other similar programs, or for other bona fide fringe benefits, but only where the contractor or subcontractor is not required by other federal or state law to provide any of the benefits; provided, that the obligation of a contractor or subcontractor to make payment in accordance with the prevailing wage determinations of the department, insofar as sections 290.210 to 290.340 are concerned, may be discharged by the making of payments in cash, by the making of irrevocable contributions to trustees or third persons as provided herein, by the assumption of an enforceable commitment to bear the costs of a plan or program as provided herein, or any combination thereof, where the aggregate of such payments, contributions and costs is not less than the rate of pay plus the other amounts as provided herein…. INTRODUCED BY REPRESENTATIVES RUESTMAN (Sponsor), MUNZLINGER, CUNNINGHAM, SCHAD, LAIR, FISHER (125), DAY, COX, THOMSON, WETER, SATER, WALLACE, KOENIG AND WILSON (130) (Co-sponsors). To amend chapter 290, RSMo, by adding thereto one new section relating to wages for work done on behalf of a school. 290.345. 1. This section shall be known and may be cited as the “School Construction Act”. The provisions of this section are intended solely to assist school districts in obtaining the maximum value from their tax dollars expended for the construction and maintenance of their educational facilities. 2. Notwithstanding any provision of law to the contrary, for work done on behalf of a school, a school district in any county except a county with a charter form of government may exempt itself from the provisions of sections 290.210 to 290.340 upon majority vote of the school board of such district. If the school district exempts itself from sections 290.210 to 290.340, the school district shall notify the division of labor standard within the department of such exemption. Rebates by workmen prohibited, exception. 290.305. No person, firm or corporation shall violate the wage provisions of any contract contemplated in sections 290.210 to 290.340 or suffer or require any employee to work for less than the rate of wages so fixed, or violate any of the provisions contained in sections 290.210 to 290.340. Where workmen are employed and their rate of wages has been determined as provided in sections 290.210 to 290.340, no person, either for himself or any other person, shall request, demand or receive, either before or after such workman is engaged, that such workman pay back, return, donate, contribute, or give any part or all of said workman’s wages, salary, or thing of value, to any person, upon the statement, representation, or understanding that failure to comply with such request or demand will prevent such workman from procuring or retaining employment, and no person shall, directly or indirectly, pay, request or authorize any other person to violate this section. This section does not apply to any agent or representative of a duly constituted labor organization acting in the collection of dues or assessments of such organization. What will the school children think? I can guess what working men and women will say.